Crops not growing like they used to? You may have depleted soil. We specialize in agronomy at Pierz Cooperative Association. By analyzing your soil for nutrient deficiencies, we can recommend specific fertilizers and offer you the seeds best suited for your land. We know how much you rely on your soil and crops. That's why we've gone the extra mile to deliver outstanding quality in Pierz, Little Falls, & the surrounding Central MN areas areas for over 100 years. For more information, contact us today! We'll be happy to discuss our service in more detail. You won't have to settle for anything less than the best when you turn to Pierz Cooperative Association in Pierz & Little Falls, MN. Reach out to us today to talk with one of our experts. We'll be happy to speak with you. Let Pierz Coop Association help you from start to finish with all your Farming needs! We have it all; Agronomy, Feed, Petroleum, & Seeds. Whether you prefer your feed and seed delivered in bulk or in bags, you can depend on Pierz Cooperative Association to be there for you. We offer high-quality supplies and can custom blend your feed. Many seed treatment options. We also sell everything from boots and gloves to animal health and supplies. Call us today to learn more about our selection of products. We look forward to working with you. The first share for Pierz Co-op was sold Sept. 20, 1911. Since then, the agricultural co-operative has been serving the Pierz/Genola and surrounding area for more than a century. 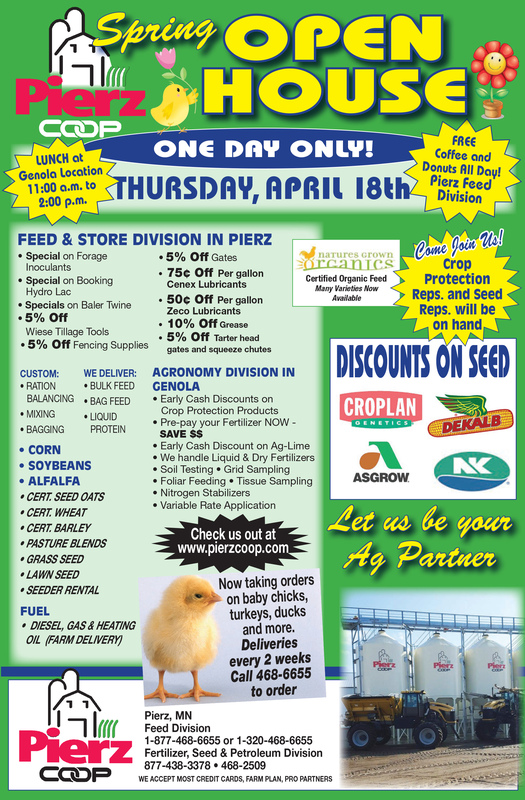 Pierz Co-op sells feed, animal products, petroleum, ground grain products, fertilizers, agricultural chemicals, and other miscellaneous items to meet the needs of local farmers, as well as offers delivery and fertilizer applications and soil testing services. Pierz Co-op has grown to become a big-time company nestled in a quaint small town. Pierz Co-op employs 18 full-time employees, three contract employees, and 12-15 seasonal employees. All of the staff has years of experience under their belts, something that Mike Lucking, the general manager, believes aids the company in providing top notch quality service. Pierz Co-op takes pride in the fact that they aren't a part of a merger, they stand alone as Pierz Co-op. Because of this, the company is able to put their customer's, who essentially are the co-operative's owners, needs at top priority. The staff at Pierz Co-op knows all of their customers by name, Lucking explains. "I can tell my staff who to deliver to, and they will know where to go," he said. Pierz Co-op constantly works to improve their services to better meet their client's wishes. As well as selling products they also have convenient services. Pierz Co-op will custom apply fertilizer, bag fertilizer, custom spray, soil test, custom blend fertilizer, apply ag lime, deliver fertilizer, rent out fertilizer spreaders, mix lawn and garden fertilizers and mix special order micro-nutrient blends. Copyright © 2019 Pierz Cooperative Association, all rights reserved.